Home/Trading Platforms/SAMCO Nest Trader/How to add and check Indices like Nifty and Sensex in NEST Trader? How to add and check Indices like Nifty and Sensex in NEST Trader? How to add NIFTY in NEST Trader? How to add Sensex in NEST Trader? The Live indices option is by default available on the top right corner of the SAMCO NEST Trader. If the indices window (as shown above) is not there on the screen, kindly press the shortcut key “Ctrl + I”. This shall display the indices window. To add a new index, right click anywhere within the index window, and click on the first option – “Show Indices Dialog”. This will open a new window containing the list of indices. Scroll up or down and select the index which you wish to add on the market watch screen. You shall be able to see a number of indices for selection which shall include NIFTY, SENSEX, the NIFTY sectoral indices like NIFTY IT, BANK NIFTY, etc. Once’ve you’ve identified the index that you want to add, right click on the index and select the first option “Add to Dlg Bar”. 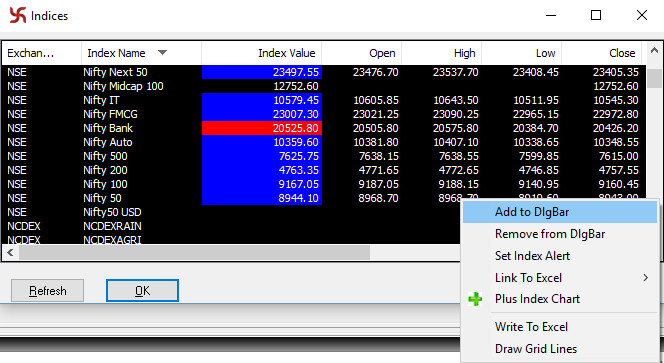 This shall add the selected index to the Dialog Bar on the market watch in Indices window.